Have you tried the latest diets fads and found you are not getting to where you want to be permanently? Have you done the group classes approach with the public weigh-ins and found that you have become obsessed about your weight? Are you ready to get off the merry-go-round of yo-yoing up and down from one fad diet to another? Are you fed up and want an approach that is proven, simple and easy? If the answer to these questions is YES, then it is time to unleash the slim within... and be the true authentic healthy you! This programme is not about analysing the past, understanding why or being dependent on anyone else or anything else; instead it is about doing something about it now! 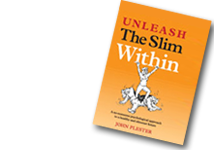 My 'Unleash the Slim Within' programme integrates the leading edge psychological approaches of NLP (Neuro-Linguistic Programming), TFT (Thought Field Therapy) and hypnotic mind programming in a unique blend that creates lasting change fast! Tested with thousands of clients over the years, this formula is the 20% of what I do that gets 80% of the results! 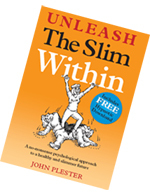 Supported by my book 'Unleash the Slim Within' and my Inner Space Series™ hypnotic audio programmes, together I have created a powerful programme that is available one to one at my clinic in Norwich.